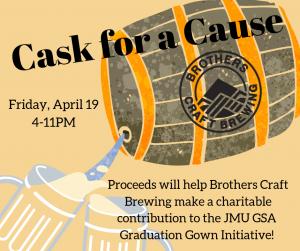 April’s Cask for a Cause will be benefiting JMU Graduate Student Association‘s Graduation Gown Initiative. Donations to JMU GSA support brilliant students from groups that are currently under-represented in the academic field in which the students study. GSA has different funds to support students whose backgrounds or socio-economic condition create barriers to the achievement of their tremendous potential. Donations have an immediate impact, and can make dreams possible for these students. Donations for this Casks for a Cause event will help students in need of caps and gowns for graduation this year and for year’s to come! In addition, JMU GSA will be throwing an End of Year Corn Hole Tournament for graduating students, JMU Alumni Association members, and the general public! Join us in celebrating the achievements of these students while having fun on a Friday afternoon. Sign ups are FREE and there will be prizes for the winners! The tournament is from 3-6 pm, so head over to the event page for current details, and keep your eyes peeled for updates on how to sign up. Since we are spending the afternoon playing corn hole, we invited our friends at Flavor Savor BBQ to set up for dinner! They will be ready to serve their delicious BBQ, brisket, and Monster Mac starting around 3:30 pm to coincide with the corn hole tournament and will continue to serve through the evening!! Come out to help out this wonderful cause by buying a pint from their cask and participating in the silent auction for the framed poster for the event. All proceeds from the cask and the silent auction will go to JMU GSA and their cause.